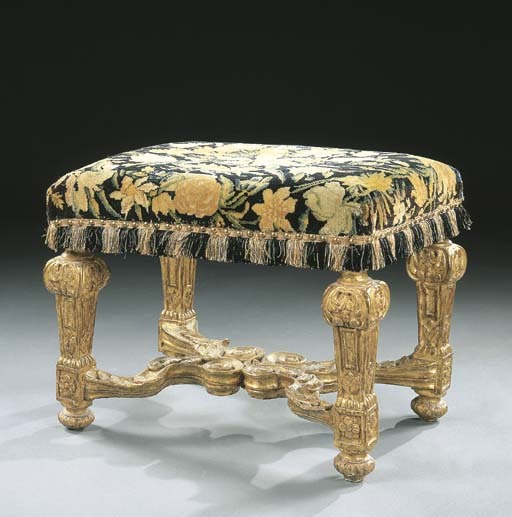 The tabouret acquired a more specialized meaning in 17th century France at the court of Louis XIV in Versailles. 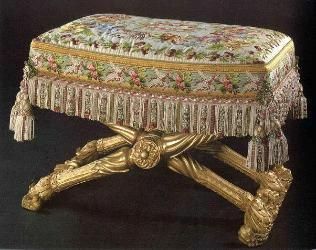 Sitting in the presence of the royal family was a much coveted honor, and the tabouret was the way to do it. The court tabouret was an elaborate, upholstered stool with curved wooden legs and tassels, carried by a liveried and wigged servant. The duchess was automatically granted the honor of sitting in front of the queen. After the death of Philippe, when Angelique returned to Versailles, she was honoured by the King with the "Taburet"
The King's voice rose. "Monsieur de Gesvres," he said to his High Chamberlain, "kindly be so good as to bring a footstool for Madame du Plessis-Bellière.